This review of Purica Fiberlicious is written to help potential customers get all the essential information regarding the effectiveness of this product, its ingredients and whether you should give it a try. 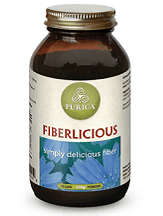 As stated by the manufacturer, Fiberlicious is a dietary fiber extracted from the chicory plant root, which binds cholesterol to support excretion. This leads to improved breakdown and absorption of minerals and vitamins and stable blood sugar levels. This product is made entirely using inulin, a starch-like substance obtained from chicory roots. Inulin is a prebiotic, meaning it is not digested by the stomach, so it goes straight to the bowels where it supports the growth of healthy digestive flora. It widely used for treating constipation and weight loss. Based on the instructions specified on the official product website, customers should take one tablespoon of Fiberlicious, two times per day. It can be taken directly off the spoon or mixed with 1 to 1.5 cups of water or preferred beverage of choice. Fiberlicious is not sold directly from the manufacturer’s website, but rather using a number of third-party sellers easily found online. That being said, prices and discounts will vary depending on where you buy the product. The most affordable price we could find was $11.99 for a 250gr bottle. This product is made using only natural ingredients. This means that side effects will be minimal to none. Pregnant and breastfeeding women should avoid using this product, as there is not enough information regarding the use of inulin during pregnancy and nursing. Purica Fiberlicious does not offer a product guarantee, which is possibly one of its biggest drawbacks. Customers who are not satisfied with this product have no option of returning it and getting a refund. Another drawback is lack of reviews, not only from the manufacturer’s web page, but also from retailer’s pages. Purica Fiberlicious is a product made using natural ingredients and it is quite affordable when compared to similar product available. Unfortunately, it is sold only using third-party vendors, which makes acquiring it a little more difficult. Not only that, but its claim of constipation relief is hard to authenticate due to lack of reviews and the fact that the manufacturer does not offer any guarantees regarding its products.